Deep Clean Concrete and Hard Stone Cleaner is a non-hazardous, caustic and chlorine free product. This product has been specifically formulated for the preparation of concrete and hard stone floors prior to coating. It is commonly used as concrete and hard stone cleaner and as such effectively removes soap scum, grease, oil and dirt. 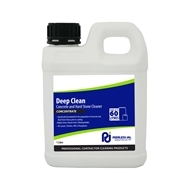 Deep Clean Concrete and Hard Stone Cleaner is also recommended for use as a cut back solution or a deep scrub solution for metal linked acrylic polishes such as Peerless Jal’s Gemini.